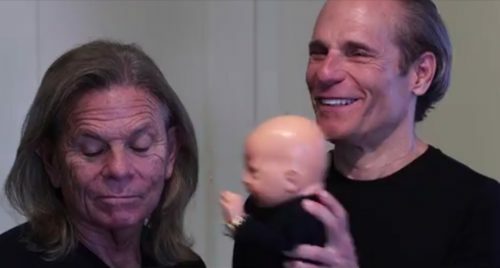 These dads in New York City have been spoiling their baby for almost thirty years. And their baby is made of plastic. AJ Sapolnick and Mark Kirby bought their baby, Digby, at a flea market in France in 1990. “All our friends started having children, and we got very annoyed because they had to cancel engagements and there were always excuses,” Sapolnick, 74-year-old retired teacher, told Page Six. “It became very real, very fast,” he recounted. “He’s our perfect child,” said Kirby, 65, a retired dentist. Digby wears custom clothes, goes to dinner with his parents at some of Manhattan’s best restaurants, and has even attended Hamilton. He wears Cartier and Rolex and even had a Bar Mitzvah at Water’s Edge restaurant. “Nothing is too good… everything he wants he gets,” Sapolnick said. They said that he’s a low-maintenance child who just needs to be polished every now and then. The family is currently touring Vietnam, where they intend to have an entire wardrobe made for Digby. “He wears preemie size, and when someone is preemie size they’re usually in an incubator — they don’t go out to black-tie occasions, or do as much as he does socially,” Sapolnick said. “We just seem like a normal New York family,” Sapolnick said.